I was watching "Industrial Revelations" on Discovery, and I noticed a lot of Industrial Revolution factories running from one power source, a steam engine or waterwheel, with power distributed via a load of parallel overhead shafts, which brief Googling tells me are called line shafts. 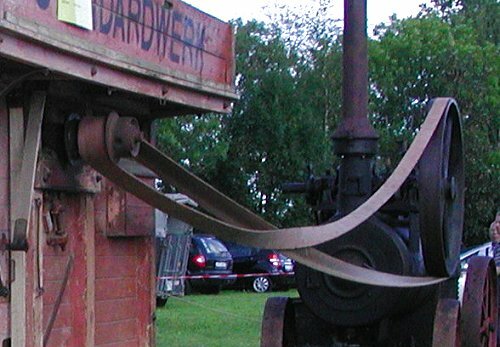 A belt runs from each shaft to each working machine, often with a free-turning wheel next to the one that drives the machine so the belt can be moved over onto the free wheel to "turn the machine off". What I can't figure out is, what kept the belts on the wheels? They don't have ridges on the edges to contain the belt, they're not V- or U-profile with a matching belt shape, they're just flat metal as far as I can see, yet the belts don't fall off. What the heck is going on, there? Industrial Revelations is pretty good, though not, of course, a patch on The Secret Life of Machines. Most or all of it seems to be on YouTube. There are other series that have covered the same ground, too; Coltrane's Planes and Automobiles deserves a mention, and in the second-series episode of Industrial Revelations where Mark Williams, the presenter, demonstrates the fulling of cloth by trampling on it in a bucket but does not have the bucket authentically filled with fermented urine, it should be mentioned that in one episode of The Worst Jobs in History, the endlessly-associated-with-ordure Tony Robinson did the same job properly. Where was I? Oh yes - belts. Traditional flat leather drive belts were a pretty good piece of technology. 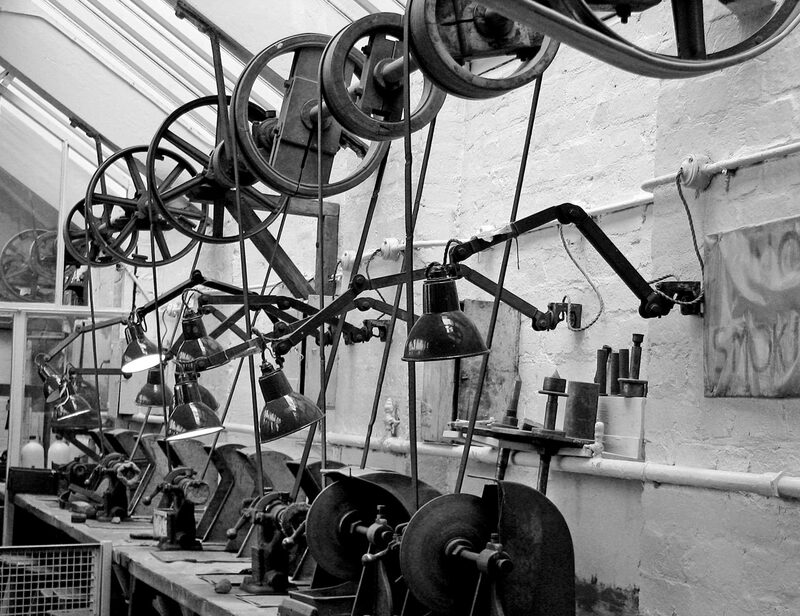 They weren't even as much of a death-trap as you might think just looking at them, since they often had enough slack that getting some piece of yourself or your clothing caught between belt and pulley wouldn't necessarily whip you into the air or smash your face into the machine. 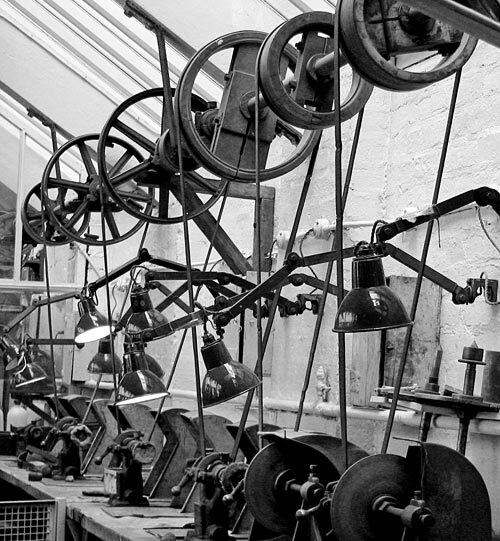 Getting your hand caught in the moving parts of the steam engine or waterwheel gearing on the other end of the lineshafting system was bad, bad news, but if only a belt had grabbed you, you had at least a fighting chance of yanking yourself free. There usually wasn't even enough pressure between belt and wheel to instantly crush your hand. Miles of belt, lots of slack. But this arrangement looks even more insultingly physically impossible than lineshaft setups. That dang belt should fall off the engine right away, shouldn't it? That looks as if it ought to stay put without any magic. But in the background, there are two more of those seemingly impossible flat-pulley belts! On all but the biggest of the Towers-of-Hanoi stepped sections of that pulley, the belt can only fall off on one side. But where's the power for the stepped pulley coming from? Another dang flat pulley, that's where! ...has been taken off the wheel to stop it driving. That's "taken off", though, very probably not "fallen off". Left to its own devices, it'd stay where it was meant to. OK, that's enough teasing. Why is it so? ...you can just about see that the pulley surface profile is slightly convex, or "crowned". 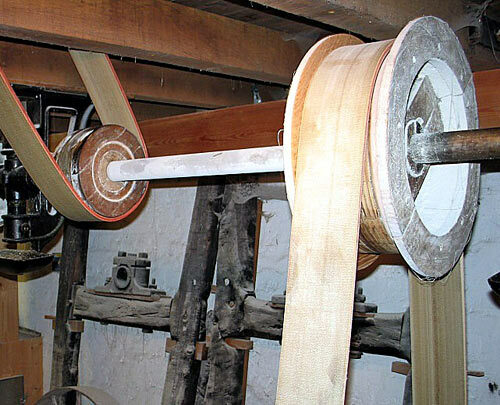 The profile of the pulley is sort of like that of a wooden barrel, except less pronounced. 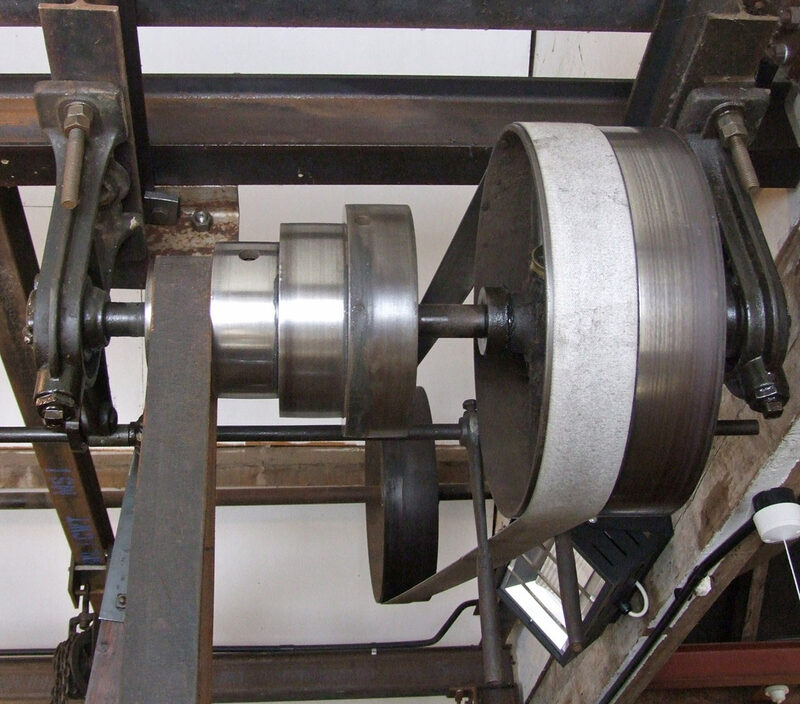 Wherever a flat belt is on a crowned pulley, it will tend to move towards the centre. This effect is reliable enough that some of the pulleys in a flat-belt power-transfer arrangement actually can be completely flat, as long as every belt runs over one or more crowned pulleys somewhere else. For practical purposes, you can stop here. Slight convex profile to pulley equals flat belt staying in the middle of the pulley. Provided all other pulleys are well enough aligned, at least; if the pulleys aren't lined up very well then even if all of them are crowned, the belt may still "walk" off one of them. But basically, crowned pulleys equals centred belts. 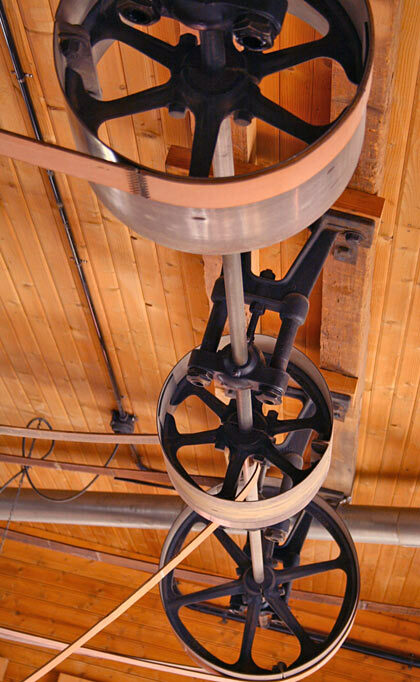 If you want to know why crowned pulleys work as they do, things get a little more confusing. Confusing enough, actually, that the question can be presented as a puzzle, or even as a "paradox". 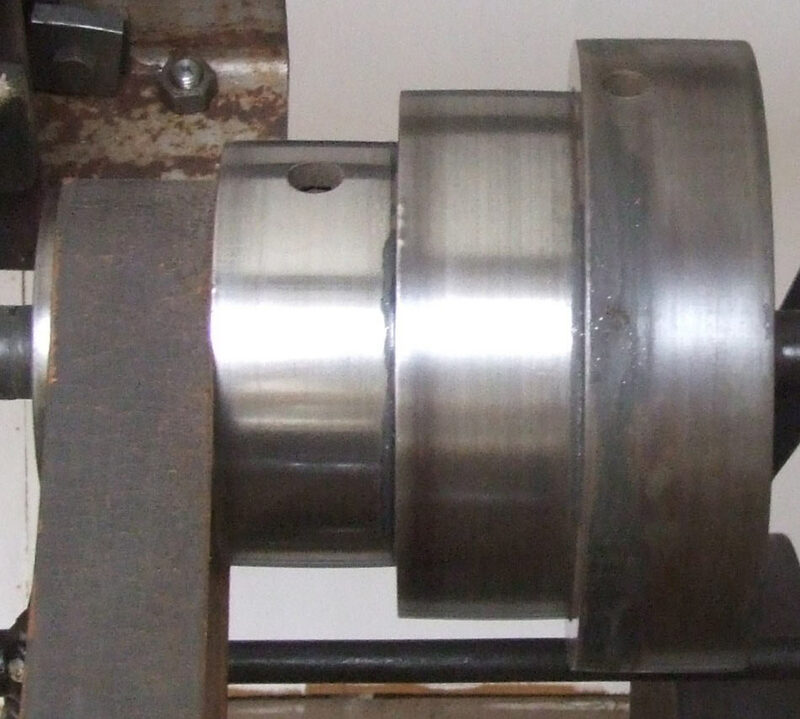 The edge of a flat belt that is closest to the middle of a crowned pulley will be stretched a little more than the other edge of the belt, because the crowned pulley has a greater diameter in the middle. 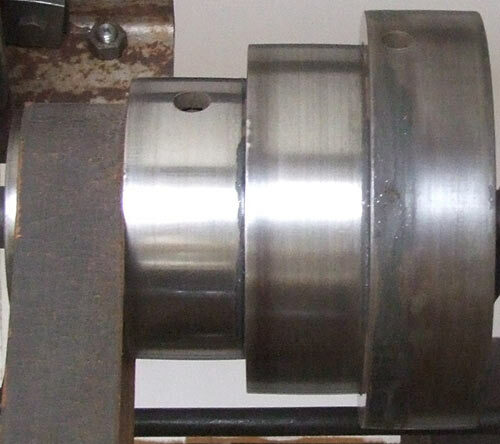 This gives the belt-edge toward the middle of the pulley higher tension and thus more traction than the other edge. So wherever the more tense, higher-traction portion of the belt wants to go, the whole belt will tend to go. Any given point on the portion of the belt in contact with a pulley will, by definition, contact a point on the pulley. But when the pulley is crowned and the belt is not in the middle of it, the slight bend in the belt means a point on the tenser side of the belt, closer to the middle of the pulley, will be unable to stay in contact with the same point on the pulley as it rotates. The slight bend in the belt created by the crown profile points the belt away from the middle of the crown profile. All parts of the belt in contact with a pulley "want" to stay in contact with that same part of the pulley - that's sort of the whole point of friction belts on pulleys. But because the tenser edge of the belt, closer to the middle of the pulley, has more grip than the other edge, the whole belt tends to climb to the middle of the pulley. This illustration from The Elements of Mechanism , which I found on this page explaining the aforementioned "paradox", may help you visualise this. It certainly helped me. 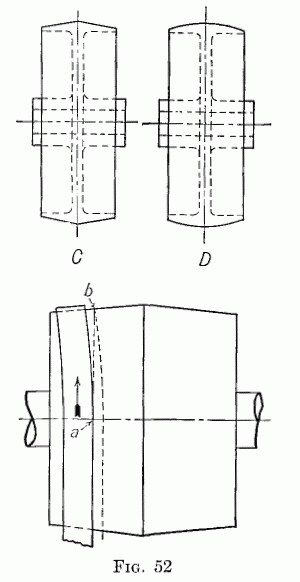 The point on the pulley (in this case two truncated cones, not a smoothly curved crown) which is under point "a" on the belt will end up at point "b" as the pulley rotates. The belt tries to stay frictionally stuck to the same part of the pulley, so it climbs to the middle. The crowned-pulley effect isn't very strong unless the crown shape is very pronounced, which would make the belts wear out quickly; this is why it can't compensate for more than slight misalignment of the pulleys. 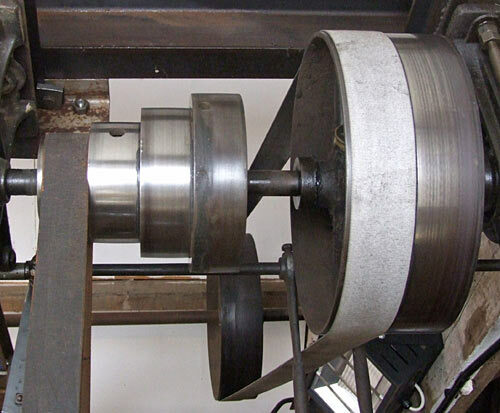 Pulleys with raised edges of one kind or another - including V-profile belts and pulleys and their relatives - can tolerate much more misalignment. 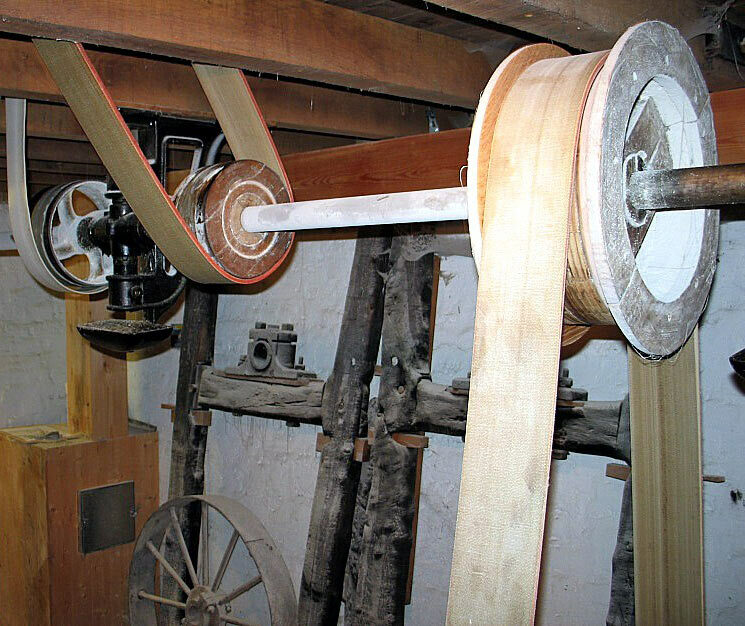 Although the era of lineshafting has long passed in the Western world, flat belts and crowned pulleys survive as conveyor belts, and in the strangest other places - the paper-handling machinery in photocopiers, for instance! ...looks as if it may have proper flat belts and crowned pulleys, but the low resolution makes it hard to be sure. And now, a bonus video; why have mere pistons when you can have a turbine? I've always wondered how those wide flat belts kept from falling off. Now I know. I guess it also makes sense why nasty injuries and/or deaths were more common in factories in the era of line shafts--there's an awful lot of inertia in a system like that. Yeah, you're not kidding. Although a lot of equipment, like slack belts, wasn't quite as terrifyingly dangerous as it at first looked, there was still pretty strong natural selection against anybody with long flowing hair or a penchant for scarves. Or just clumsiness. Every episode of Industrial Revelations features the presenter gesticulating next to some vast lump of reciprocating and rotating ironwork; all those exposed high-powered components, plus the popularity of beer with every meal for the working man of a couple of hundred years ago, probably did a lot to weed out the uncoordinated. This looks to me like the rolled-up version of how trains stay on the rails using conical wheels. Physicist Richard Feynman explains how a train stays on the tracks. From the BBC TV series 'Fun to Imagine"